The artist behind this design studied Amy Johnson’s flight path, and used her journey to show the freedom of the skies during the 1930s. The underside of the moth is painted with the colour of Amy’s plane, Jason, in bottle or British Racing green. The head of the moth appears as though in the clouds, wearing flying goggles featuring the eyes of Amy Johnson – something the artist felt stood out in her photographs. 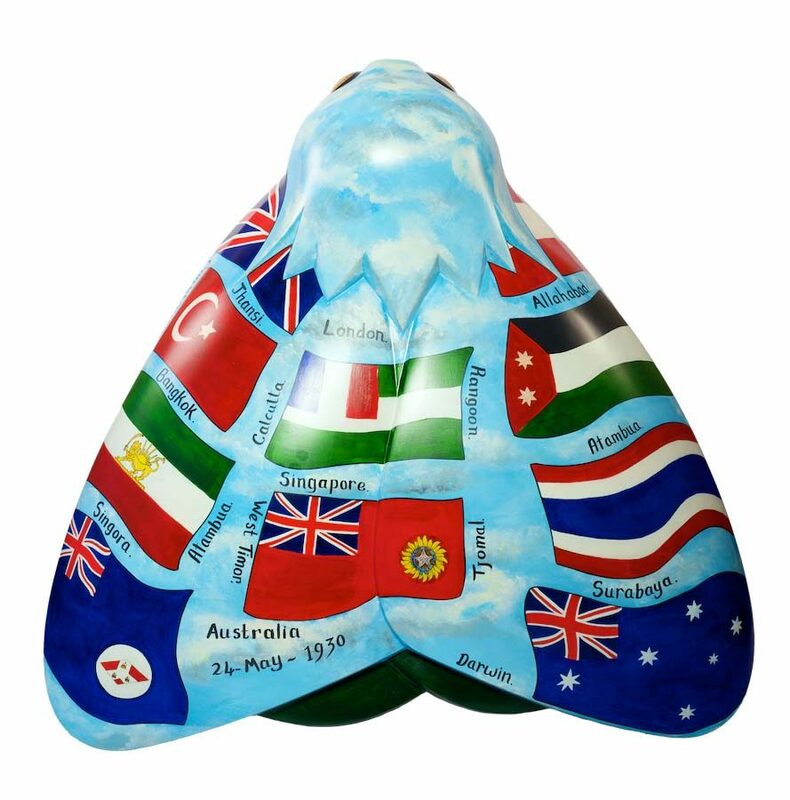 The moth’s body displays the names and national flags of each country Amy flew through, accurate to the 1930s time period under British reign. Peter Coates graduated with a First-class honours degree in Contemporary Fine Art from Hull School of Art & Design in 2010. Since then he has worked on various project in Hull for clients including Hull School of Art & Design, Studio Eleven, Freedom Festival and the Yorkshire Wildlife Trust, as well as commissions for private clients. Peter enjoys working with reclaimed materials, making something unwanted or discarded and giving it a new lease of life. He also likes traditional crafts, where fine art can blend with the craftsmanship of the past.